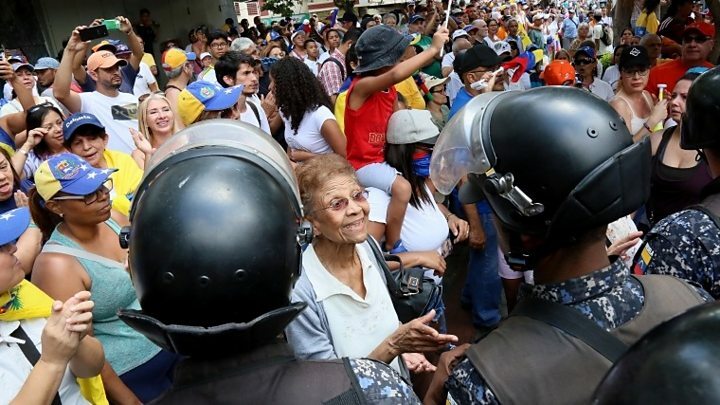 Saturday's protests follow widespread power cuts that have affected much of Venezuela since Thursday. Some protesters pushed against police in riot gear shouting "murderers" and the officers responded by firing pepper spray at them. Addressing the rally later, Mr Guaidó announced he would embark on a tour of the country and summon all his supporters to attend a mass protest in Caracas "very soon". "We are going to come, all of Venezuela to Caracas, because we need all of them united," he said. Using a megaphone to be heard above the chanting crowd, he called on his followers to remain "united and mobilised... in the streets". Speaking outside the Miraflores presidential palace, he referred to Mr Guaidó as "a clown and a puppet" of the US. "They invited the armed forces to carry out a military coup and their reply was clear - they have defeated the coup plotters," he said. 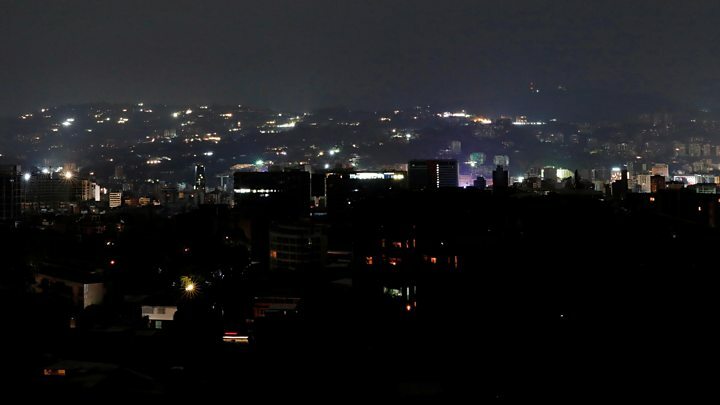 Image caption President Maduro told supporters to celebrate "anti-imperialism day"
The widespread power cuts have reportedly been caused by problems at the Guri hydroelectric plant in Bolivar state - one of the largest such facilities in Latin America. In Caracas, traffic lights in some areas were back in action but the city's metro remained closed, reports said. President Maduro said on Saturday that electrical substations had been attacked with "the support and assistance of the US". "Many saboteurs have infiltrated the state's electrical company," he said. "We have evidence and they will be held accountable. We will also introduce new measures to protect our electrical system from hackers." In Caracas's University Hospital, 25-year-old patient Marielsi Aray died after her respirator stopped working. "The doctors tried to help her by pumping manually, they did everything they could, but with no electricity, what were they to do?" said her uncle Jose Lugo. Generators at a Caracas children's hospital failed, with staff reportedly working overnight using their mobile phones for light.